DFU stands for Device Firmware Update, entering DFU Mode is how you adjust the firmware on your iPad or other iOS device. This can be a helpful trick for troubleshooting some complex issues when you need to perform a DFU restore on iPad, or if you want to downgrade or update the iPad firmware with IPSW firmware files. 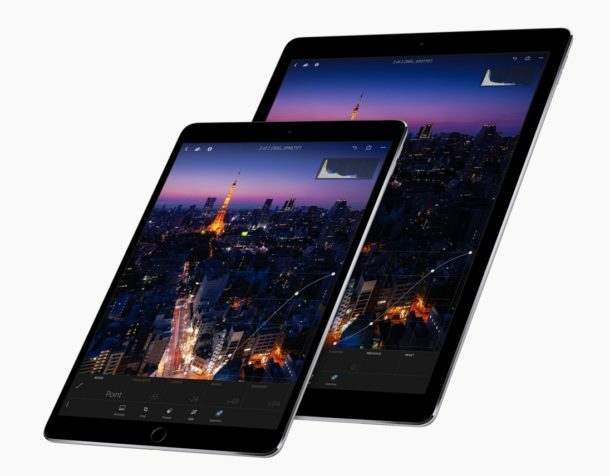 Getting into DFU mode on an iPad is the same for all iPad models with a pressable Home button, including iPad, iPad Air, iPad Mini, and iPad Pro. The DFU mode process for iPad is close to the same process as entering into iPhone DFU mode (or iPod touch for that matter) on devices that have a clickable Home button, but it’s different from later models that don’t have the Home button at all. Overall it’s pretty easy, just follow the instructions below to learn how to enter into DFU mode on iPad. IMPORTANT: When in DFU mode, your iPad screen will stay completely black. If you see an Apple logo or otherwise you did not enter DFU mode, so you would need to start over again. If you see an Apple logo or iTunes logo, you probably entered into Recovery Mode instead, which can sometimes work for restoring. The key thing to remember with DFU mode is the screen stays black, but iTunes alerts you to the device connected and ready for a restore. Note that for jailbreakers, once in DFU mode your jailbreak or firmware modifying app should take over, so follow those instructions from here on. The reason most people need to get their iPad into DFU mode is to either perform a jailbreak, or to adjust the iPad firmware either through an upgrade or downgrade. If you want the latest versions of iPad firmware files you can go here to find the latest iOS versions IPSW firmware files to download. Exiting DFU mode happens automatically if you restore the device with iTunes, or you can just force reboot iPad to exit DFU as well. 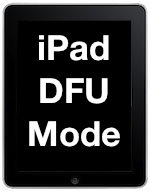 If you have any questions, comments, or experiences with DFU mode on iPad, do share them below! I’m just curious, am i still able to get apps from the app store/ use previously purchased apps if i jailbreak my ipad? HOW LONG DOES IT STAY IN DFU MODE? Thanks is a small word for this tip. Can’t thank you enough. To ANYONE getting the “please connect your device”. You are in DFU mode… Go into Recovery mode. Open Tiny Umbrella, plug in your device ON and click “Enter Recovery” works like a charm. Thank you…:) It worked awesome. Call the person for the pass code unless???? Genius Bar restored my iPad #1 via DFU. But at times the iPad turns off while using. What is the probllem? I keep getting an error code (3194) wont detect the device (ipad)… Any help? Can’t get the timing right…Frustrating, any more ideas out there? Have you tried doing the apple dance? I’ve connected the ipad to itunes but itunes won’t detect the ipad at all. ok what if it is connected to another person’s itunes then what do you do? Hi guys pls help me. I both an iPad4 GSM on eBay with a given firmware malfunction problem. When i connect the iPad4 GSM to my MAC and iTunes is up and running, the iPad will be recognized but but i’m getting the message to run this iPad in recovery modus which i tried but somehow after 5 min i’m getting a msg telling me that im not connected to the internet (wrong – i am) and i can not restore my iPad. Please help me. Thank you! how do i bypass not knowing an apple id info? my 7 yr old locked herself out ipad mini and i did the recovery through itunes and now it needs apple id to set up ipad. i nor her remember this info. please help! I work at a motel and an iPad was left for 3 months. Nobody ever called to claim it. We tryed the restore mode but it says you need the old Apple ID. Without knowing that am I just S.O.L with not knowing any of this info??? I have an iPad and two Apple watches that have Apple ID’s in Activation I needed to see about getting the around activation lock.